In our travels and while watching travel shows on TV we had often heard about Yamba and how beautiful it was. So seeing we were in the area we knew we just had to stay here and are we happy we made this decision. 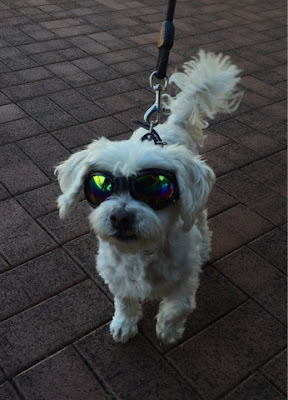 Yamba is 670km north or Sydney and 279km south of Brisbane on what is called the Clarence Coast. 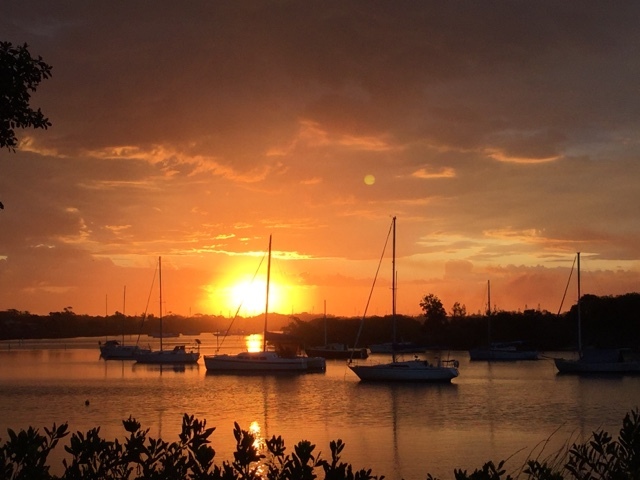 Yamba along with Iluka are situated on either side at the mouth of the majestic Clarence River. The Clarence River is the largest waterway on the east coast of Australia travelling over 400kms from it's source in the McPherson Ranges in Queensland to the Pacific Ocean. 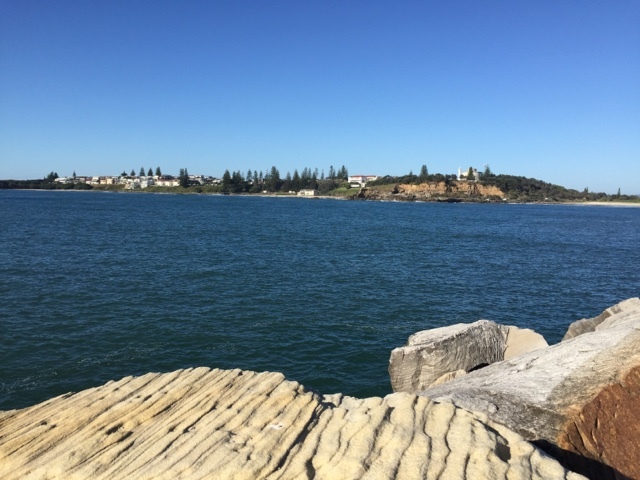 In the past Yamba has been voted the best town in Australia by Australian Traveller Magazine due to its beautiful beaches, award winning restaurants and great atmosphere. 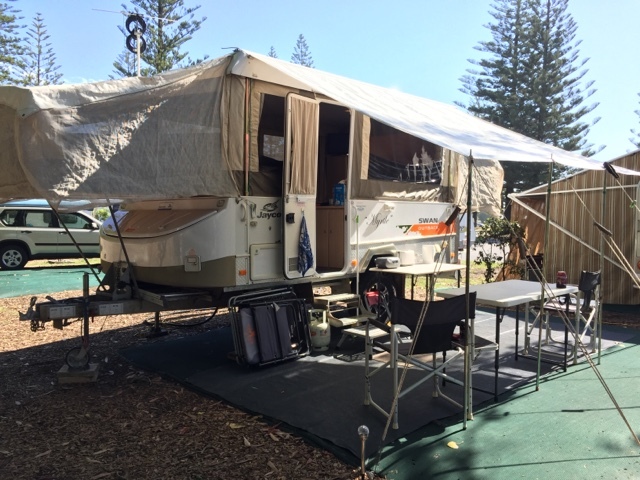 We booked into the Calypso Caravan Park for a week and wanted to stay longer but are unable to due to the Yamba Rod Run being held this weekend, when up to 400 hot rods and vintage cars ascend onto Yamba for their annual show. 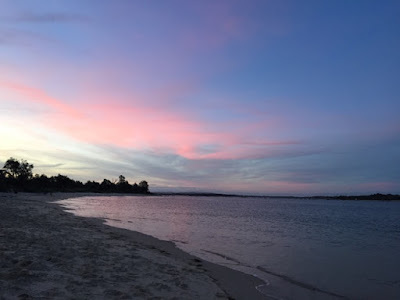 We are camped within walking distance to the ocean and about 50 steps from the river and each night (if it's not raining, as the first few days did) we are treated to some amazing sunsets. We have been out fishing once but didn't have any luck getting anything into our fishing bucket. 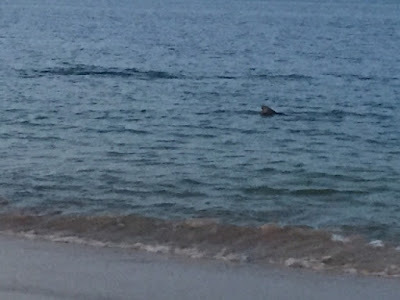 As we sat there just prior to the sun setting we noticed quite close to the shore a fin gently gliding through the water. It would submerge and then surface again somewhere else. 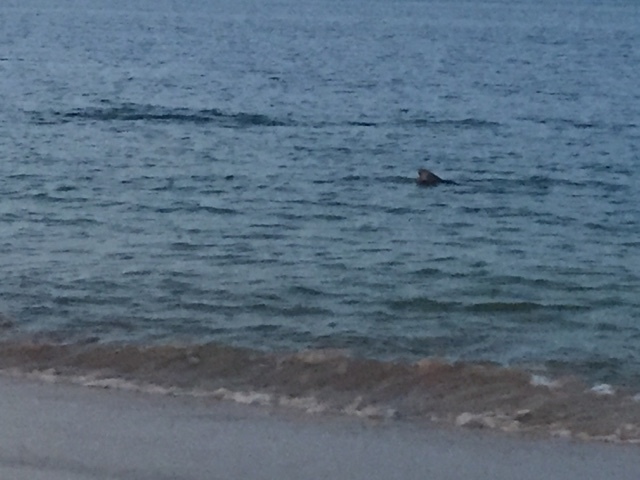 At first we were not sure if it was a shark or a dolphin but after we saw the fin quite close, decided it was most probably a shark!!! 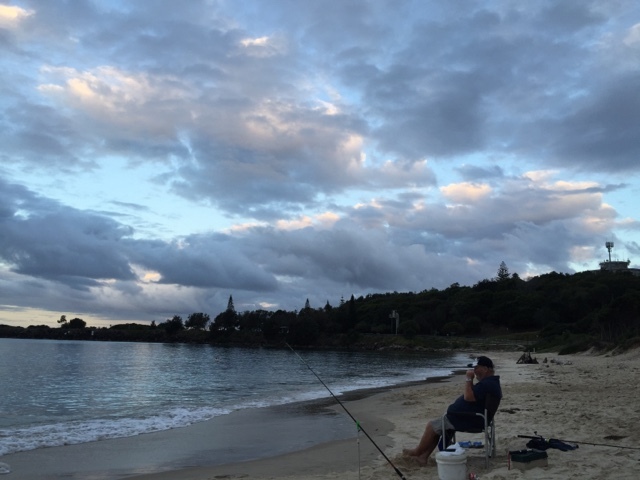 After the sun had gone done, all of a sudden I had a huge jolt on my fishing rod that had so much force it actually dragged me a few steps along the beach toward the water. After only about 20 seconds of me holding the rod and trying to keep my balance the line snapped and I almost fell back on my bum!!! So that was the end of my fishing for the night, but we are heading back out tonight. No whiting at whiting beach! One day when it was quite overcast we decided to go for a drive into MacLean which is only a short drive from Yamba. 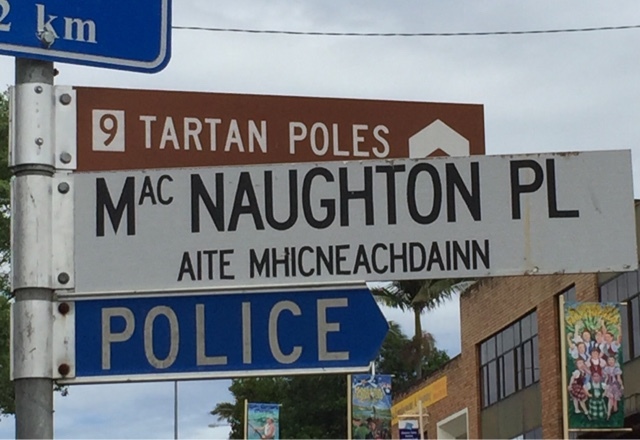 Due to its Scottish roots MacLean is advertised as "The Scottish Town in Australia". The Scottish settlers to MacLean (originally named Rocky Mouth) were mainly highlanders, driven from Scotland by the Highland Clearances and famine in the 1840's. 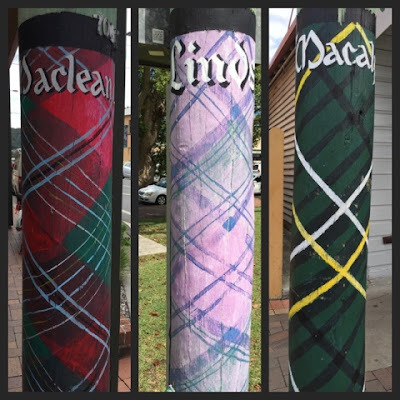 At Easter every year the town holds a Highland Gathering where the town commemorates MacLeans Scottish Pioneers. Also situated on the Clarence River it is quite a quaint little village with some beautiful historic buildings. Some of the street signs are in Gaelic as well as English and there are over 200 power poles painted with Scottish clan tartans. I tried but I can't pronounce MacNaughton Pl in Gaelic!! End Note: We just got back from a couple of hours fishing. Still no luck on the fishing front but we were treated to an amazing sunset sky, a sea eagle flying above, some sort of bid diving into the water to get our fish, pelicans and the joy of watching a pod of dolphins swim only metres from the shore.